James Ernest Darr, sheriff of Coshocton county from 1921 to 1925, died Sunday night in city hospital. Mr. Darr, known familiarly to his many friends as Ernie, formerly had been active in Democratic politics. His death followed an illness of three weeks. James Ernest Darr, 43, former sheriff of Coshocton county, died in city hospital at 9:20 Sunday night after a three weeks' illness from complications. Mr. Darr was born in Roscoe, Jan. 19, 1891. He married Miss Clara Jamison, Dec. 24, 1915. In early life, he was an employee of the Pennsylvania Railroad. For four years he was a deputy sheriff. 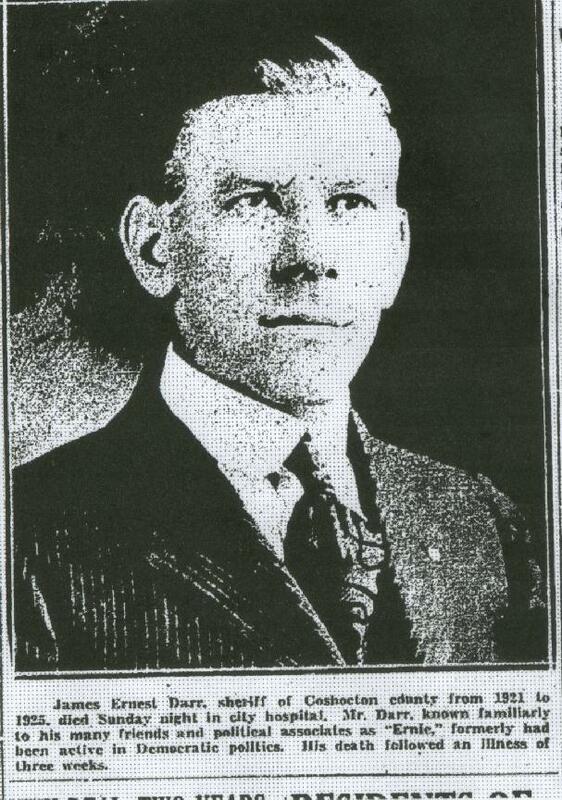 In 1920, Mr. Darr was elected sheriff and re-elected for a second term in 1922, serving four years in all. Mr. Darr had been a leader in local Democratic organizations for many years. In addition to his widow, he is survived by a son, Carl, and a daughter, Mary Louise, both of the home. Other survivors include a sister, Mrs. Harry McCluggage; seven brothers, Enoch, Elihu, Alonzo, Charles, Joseph and Frank, all of the Tunnel Hill vicinity, and Russell Darr of Dragdon, Utah; and a half-brother, John Darr of Conesville. Funeral services will be held at 2 p.m. Wednesday at the home, 229 North Third st. Burial will be in South Lawn Cemetery.